Partial Synopsis from Good Reads: Jan Karon's millions of fans can't wait to sit down with her heartwarming and hilarious characters, who have a way of becoming family. In fact, readers and booksellers across the country kept Out to Canaan and At Home in Mitford on The New York Times bestseller list for months. In A New Song, Mitford's longtime Episcopal priest, Father Tim, retires. However, new challenges and adventures await when he agrees to serve as interim minister of a small church on Whitecap Island. My thoughts: There was hesitation about reading this book. I didn't think I would care for one that wasn't set in Mitford. Well, silly me! This little tale is just as charming at the other Jan Karon books I've read! The residents at Whitecap are colorful and quirky while the folks from Mitford call frequently with all kinds of emergencies, problems, and a little gossip, too! ;-) I loved this book! If you haven't read this delightful series, watch out! It will steal your heart! 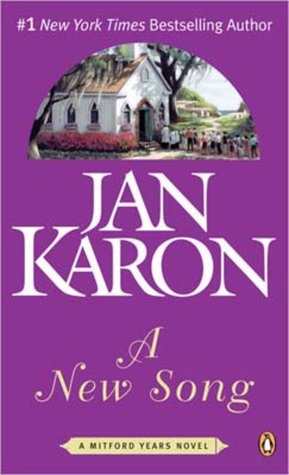 I've read a few Jan Karon books, mostly a loooong time ago when I worked nights at a very boring job and needed lots of reading material. As I recall, they were charming. You chose the perfect word. I'll have to keep her books in mind when I want a light read. I read these in high school when all my friends were going out to football games. ;) Such sweet books. And I've always wanted to try an orange marmalade cake recipe because of them.